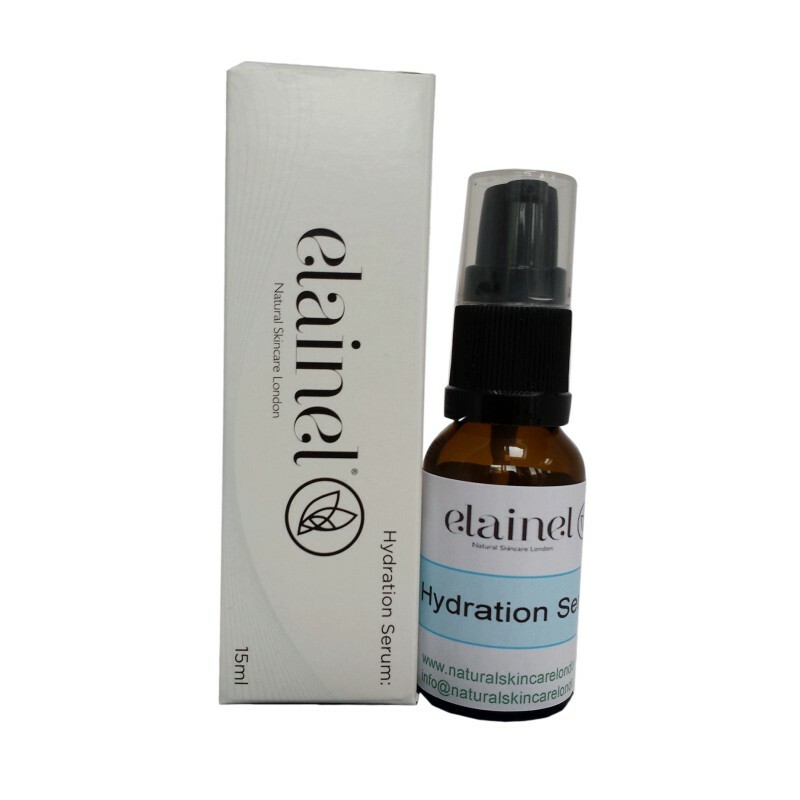 The hydration serum is beautifully formulated to hydrate, calm, regenerate and balance your skin. Pomegranate extract: Strengthen skin cell membranes. Hyaluronic acid and CoQ10: Skinfood to keep skin hydrate. Vitamin B3 and C : Even skin tone. The serum minimizes damage from harmful environmental factors and helps the skin absorb moisture. Designed to promote elasticity. Apply on clean skin in upward stroke, best after elainel toner in the morning and / or evening. Rosa damascena flower water**, Anthemis nobilis (Chamomile) flower water**, Cananga odorata (Ylang Ylang) flower water**, Aqua, Aloe barbadensis leaf extract**, Citrullus lanatus (Watermelon) seed oil, Glycerin**, Tocopherol, Niacinamide (Vitamin B3), Sodium ascorbyl phosphate, Cucurbita pepo (pumpkin) seed oil**, Rosa canina (Rosehip) seed extract**, Benzyl alcohol, Amorphophallus konjac root powder, Squalane, Allantoin, C12-15 Alkyl benzoate, Punica granatum (Pomogranate) fruit extract**, Plumeria acutifolia (Frangipani) flower extract, Agonis fragrans branch/leaf oil, Sodium benzoate, Potassium sorbate, Lactic acid, Salicylic acid, Propylene Glycol, Aniba rosaeodora (rosewood) wood oil, Sodium PCA, Sodium lactate, Phenoxyethanol, Citric acid, Urea, Hydrolyzed soy protein, Oleth-20, Sodium Hyaluronate, Yeast extract, Sorbic acid, Ubiquinone, Sodium phosphate, Ethylhexylglycerin, Sorbitol, Asparagus officinalis root extract, Rosmarinus officinalis leaf extract**, Benzyl Alcohol*, Linalol*, d-Limonene*, Geraniol*, Citronellol*. ** Organic ingredients, * component of natural essential oils.